From their first visionary center in Hawaii to their latest revolutionary venture with The Pier Shops at Caesars, the endeavors of the Gordon Group continue to redefine the boundaries of retail development. For almost 40 years, the goal of this company has not been to merely build structures but, rather, to destroy conventions. 1965 Sheldon Gordon and E. Phillip Lyon form The Phillip Lyon, Gordon and Company. 1970 The Kahala Mall opens in Honolulu, HI, becoming the first enclosed mall in Hawaii. 1972 The Pearlridge Mall opens in Aiea, HI, featuring the first monorail system in a shopping center. 1978 Vallco Park opens in Cupertino, CA, reflecting the first use of a merchandise bridge over an eight-lane highway. 1980 The Beverly Center opens in Los Angeles, the first of its kind in America where the retail is located above five levels of parking. 1982 E. Phillip Lyon retires; Sheldon Gordon forms The Gordon Company. 1982 The Gordon Company opens Ma Maison Sofitel in Los Angeles. 1988 The Gordon Company opens the San Francisco Center with Nordstrom and nine floors each accessible by the first and only spiral escalator in the Western Hemisphere. 1992 The Forum Shops at Caesars, phase one, open in Las Vegas, becoming the premier nongaming attraction in the city; the company’s first collaboration with Caesars. 1997 Phase II of The Forum Shops opens. Sales continue to increase above $1250 psf. The Gordon Company changes its name to Gordon Group Holdings. 1998 Gordon Group creates the Fashion Outlet of Las Vegas in Primm, NV, becoming the first themed outlet center in America. 2000 Gordon Group creates Bridgemarket in New York City, located beneath the 59th Street Bridge. 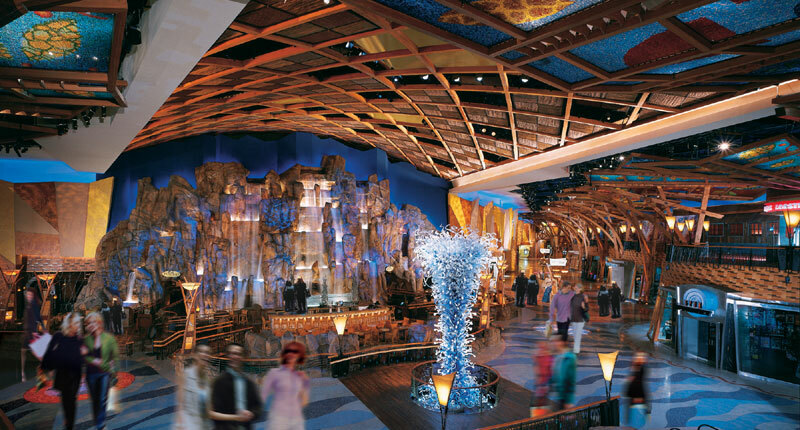 2001 Gordon Group creates a 150,000 retail and restaurant complex at Mohegan Sun Casino in Connecticut. Sales break $1000 psf. 2005 The Pier Shops at Caesars open in Atlantic City (the second collaboration with Ceasars). 2009 Gordon Group is hired as Developer for the outlet retail at Foxwoods. 2011 Gordon Group announces its partnership with Tanger Outlets on the Foxwoods outlet project which is now named Tanger Outlets at Foxwoods. 2013 Ground breaking begins on the Tanger Outlets at Foxwoods. 2015 Becoming the first indoor outlet mall, Tanger Outlets at Foxwoods opens featuring 80 discount stores. While many people attribute the explosion of Las Vegas to Steve Wynn, chairman of Mirage Resorts, Steve Wynn insists the credit must be shared with Sheldon Gordon, founder of Gordon Group and visionary behind The Forum Shops at Caesars Palace in Las Vegas, opened in 1992. Boasting the highest volume sales per square foot in America, The Forum Shops was the first nongaming attraction in Las Vegas turning the city from a gamblers-only hotspot to a haven for tourists worldwide. Such accolades are not uncommon for a man whose developments are considered revolutionary. Since 1970, Mr. Gordon has created properties with never-before-seen features. In Hawaii, when he was required to preserve an environmentally protected watercress farm in the location of the Pearlridge Mall, his solution was to build the mall in two sections flanking the farm and connecting them with the first-ever shopping center monorail system. When an eight-lane highway presented an obstacle to creating Vallco Park in Cupertino, CA, he created another revolutionary concept — a merchandise bridge spanning the highway. Matt Armstrong is a seasoned hospitality and gaming executive with experience in the lodging, casino and retail industries. Armstrong’s expertise encompasses the disciplines of project development, property management, acquisitions, marketing and raising debt and equity financing. Armstrong is currently Executive Vice President, Development for Gordon Group Holdings a position he has held since 2008. Armstrong’s responsibilities involve project management, raising equity and debt financing, new project development, marketing and developing long term strategic partnerships. Armstrong brings a wealth of hospitality and gaming knowledge to the organization which is currently involved in a very innovative retail development at Foxwoods/MGM Grand in Mashantucket Connecticut. Prior to joining the Gordon Group, Armstrong was Senior Vice President of Property Development with Morgans Hotel Group, the boutique hotel company founded by Ian Schrager.